As the experienced among us know, the holidays can be hard on a celiac. Cross contamination at dinner parties abounds, everyone forgets about you at the office potluck, cocktails contain a bevy of unidentified gluten-packed liqueurs, and if the turkey is stuffed… forget about it. But as bad as that can be, imagine being an 8 year old with a sweet tooth and you’re told that you probably can’t eat half the candies you collect during what is arguably the Super Bowl of childhood: Halloween. This is, at best, a recipe for a major bummer and at worst, a bummer that also leads kiddos into temptation and leaves them suffering from gluten poisoning. Who wants that? Nobody. Enter, The Teal Pumpkin Project. Conceived by FARE (Food Allergy Research & Education), this social movement/adorable DIY was engineered to not only spread awareness about the prevalence and dangers of food allergies, but to empower people to think beyond candy. 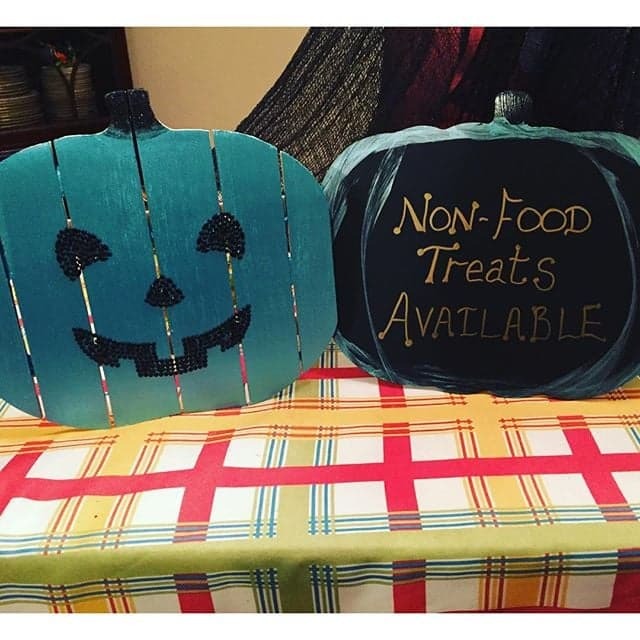 Come Halloween, homes with teal pumpkins on their doorsteps promise to have non-food (or at least, non-candy) treats to offer up, from pencils to temporary tattoos, so that allergy-affected tricksters can have their share of the fun too. And you know what? It’s not just about gluten. Now in its third year, this inclusive project offers a solution for every allergy imaginable, from dairy to soy. And as an added benefit, it takes the focus off sugary treats, reminding us that Halloween can be a lot of fun for reasons that don’t involve gorging ourselves on chocolates and pixie sticks. And people are pretty into that. Just take a look at all the adorable, crafty projects people are sharing on Instagram! The world, it’s a-changin’. So, want to join in the fun? Start with the essentials: the treats. Depending on your neighborhood and how many kids you expect, these can be as basic as stickers or as elaborate as decorated bottles of bubbles. The Kitchn’s sister site, Apartment Therapy, put together a great list of ideas, plus links to purchase online. Even if you still want to serve candy in addition to a selection of toys (people love candy! That’s okay!) remember to at least check that the sweets you choose don’t include hidden contaminates (in this case, we’re talking gluten) and let folks decide for themselves at your door. This year’s updated list of safe gluten-free candies can be found here. 10 Ways to Decorate a Teal Pumpkin, an inspirational slideshow from the DIY Network. Melted Crayon Teal Pumpkin, tutorial from Makely. 29 Insanely Creative Ways to Decorate Your Teal Pumpkin, from Popsugar. In the event you aren’t into DIY, or you prefer to skip pumpkins in general, never fear: you can also print this sign from FARE to display on your door or mailbox. So, think you’ll make your own Teal Pumpkin this year? We’d love to see it! Feel free to share your photos with us on Facebook or Instagram. Happy Halloween!